What Is Scumbling in Art? Scumbling refers to a painting technique which involves applying a thin layer of paint with a dry brush and a loose hand over an existing layer. The idea is to allow parts of the already existing paint below to remain exposed. In most cases, scumbling is used over dried paint, but you can also use it over wet paint. You just need to be careful with the colors blending together if you are scumbling over wet paint. It is most commonly thought of as an oil painting technique, but it can also be used with acrylic or watercolor paints. When to Use Scumbling in Art? To add texture to the surface. 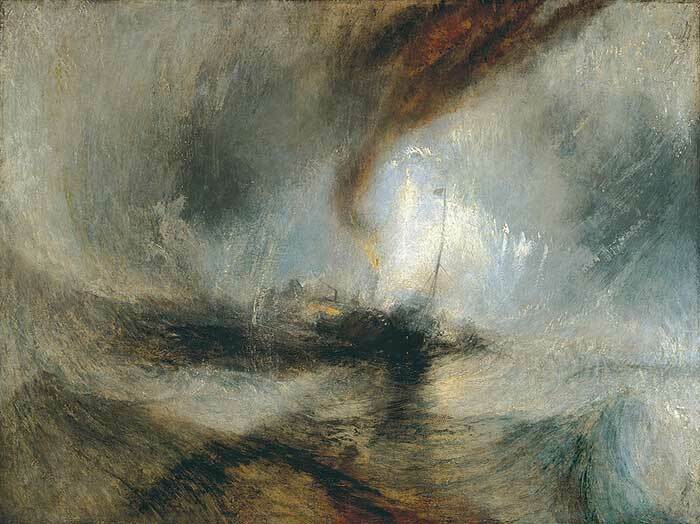 To create a sense of atmosphere and depth (like in the painting by Joseph Turner below). To break up a background area to make it less monotonous. To build up highlights on top of a dark background. To make slight adjustments to color shapes. To soften the transition from one color to the next. To create a broken color effect which takes advantage of optical color mixing. To use the scumbling technique, you should pick up a small amount of paint straight from a tube with a dry brush and apply it loosely to the canvas. You do not want the paint to blend with the existing colors or to be so thick that the colors below are completely covered; you want the paint to scumble and break on top. You should also vary the strokes you use so that it does not look repetitive. Tip: When scumbling color on top, use this as an opportunity to keep building up a sense of form and structure. Allow your brush to follow the contour of the subject. In general, it is more effective to scumble light colors on top of darker colors. If you are using watercolors, then instead of scumbling white paint on top for your highlights, you should just leave areas of the paper exposed. The white paper is far more effective than white paint as your lightest light. But you could use scumbling to recover any white areas you accidentally cover up. You should avoid using any additional mediums or solvents when scumbling. In most cases, paint straight from the tube is the most suitable. Opaque color is often used for this technique, rather than transparent color. When I think of scumbling, the first artist who comes to mind is Claude Monet. 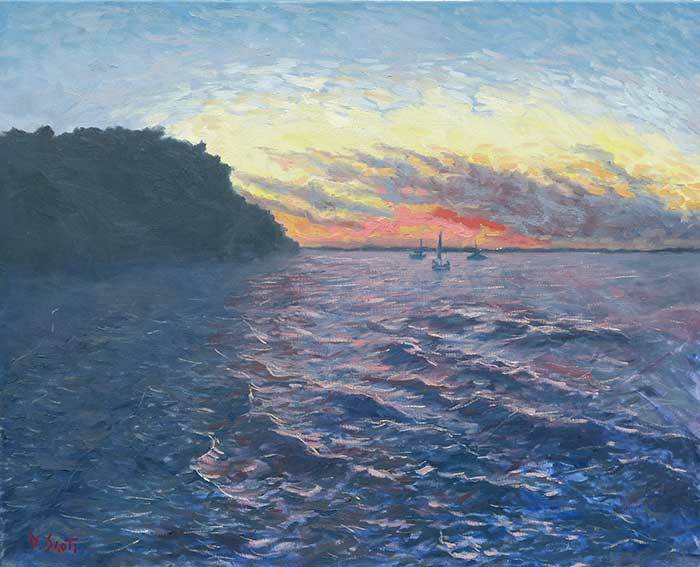 He used the technique in many of his paintings to build up a stunning vibration of color. 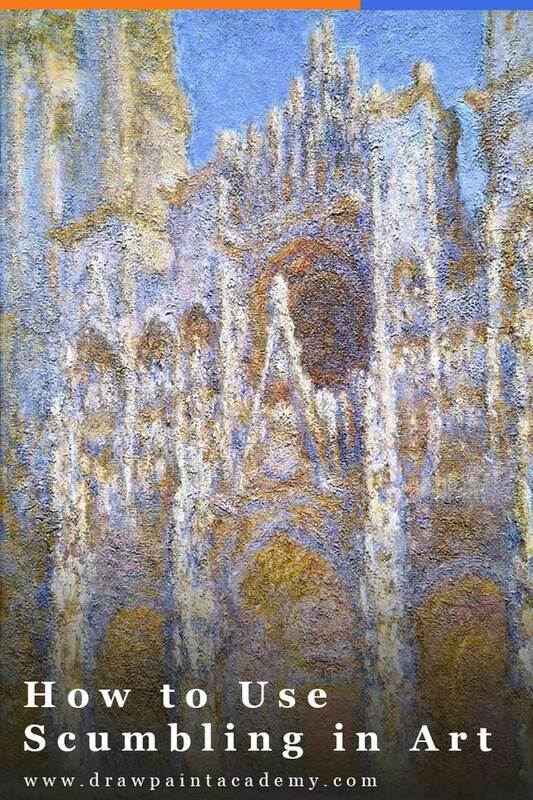 In particular, his paintings of haystacks, water lilies and the Rouen Cathedral are great examples of this. Below is a painting from his haystacks series. Monet painted this by scumbling numerous layers of color on top of each other. The end result is a vibrant display of oranges, yellows, reds, greens and purples. 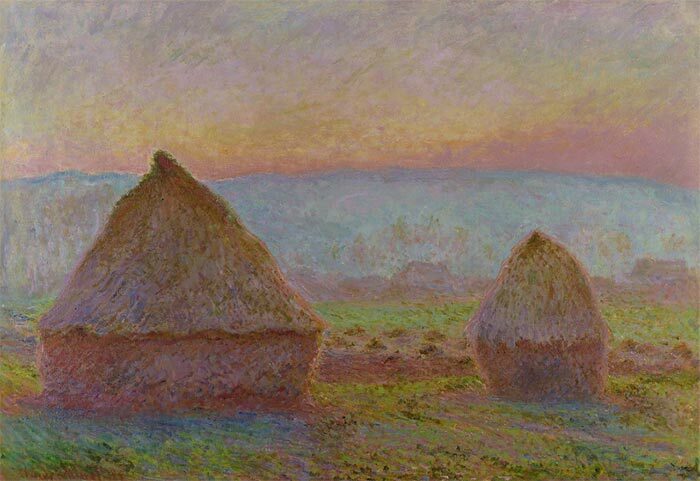 Monet also scumbled both light and dark colors (notice the dark reds and greens used for the haystacks and grass). He is a close-up of Monet's scumbling work. 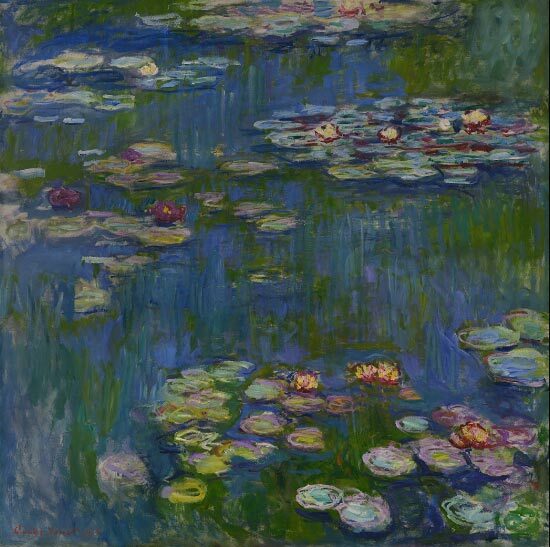 Below is a much cooler painting by Monet from his water lilies series, which features a pleasant arrangement of greens, blues, yellows and purples. Monet used scumbling to build up the dynamic, broken colored surface. In the close-up below, you can see all the distinct colors applied layer-on-layer. It seems he went back and forth scumbling with different greens, blues, purples and yellows until the canvas was filled with color. 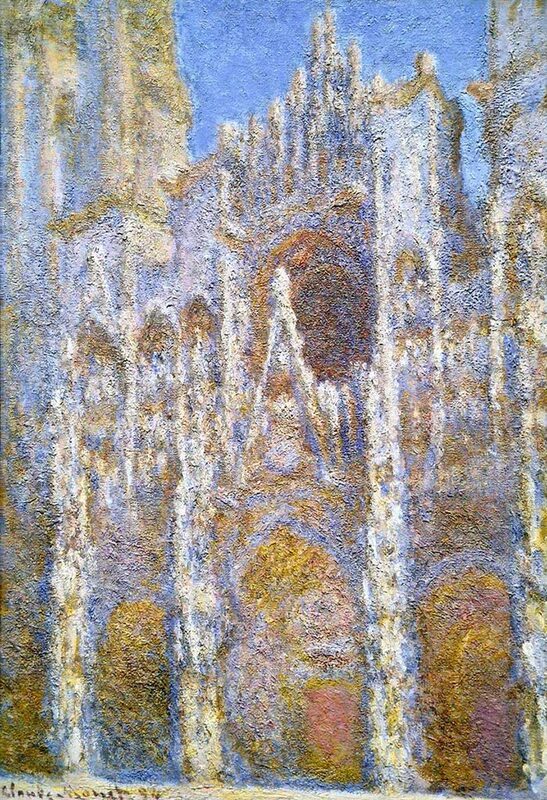 Monet's series of paintings of the Rouen Cathedral demonstrate how you can use scumbling to paint the illusion of texture. In the painting below, notice the build-up of blues, purples and oranges. The broken color creates the illusion of the rough building, which is reiterated by the physical texture of the thick paint. 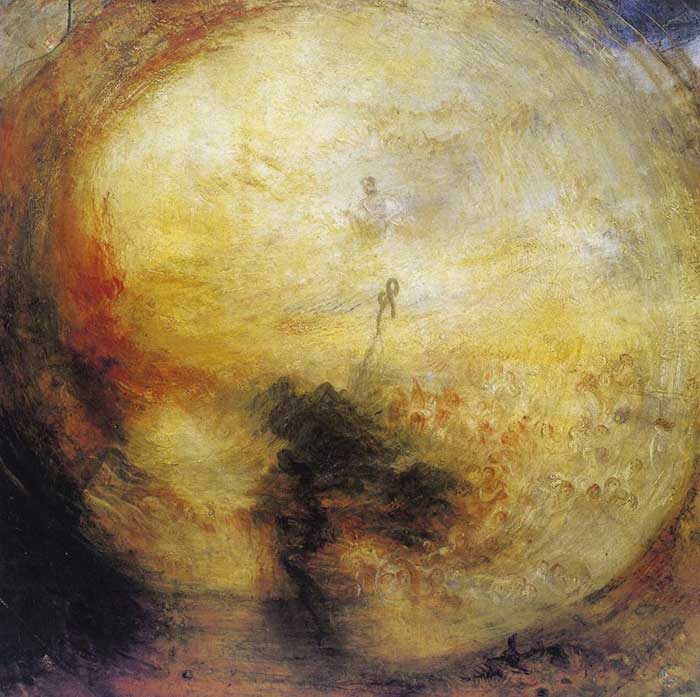 Turner used scumbling to paint his atmospheric and moody seascapes and landscapes. He would build up layer upon layer of scumbled yellows, reds and even blacks, allowing parts of the lighter layers below to remain exposed. The end result is a strong ambient effect, with the feeling of light bursting through from the background. In my painting below, I made use of scumbling to paint the choppy water. I painted a rough colored ground of broken blues and purples, then once that layer dried, I scumbled light purples over the top. Notice how I followed the contours of the water. Thank you. You make IT easy to understand. Thanks DAN For great help me to know painting and encouragement.